Drumroll please…. 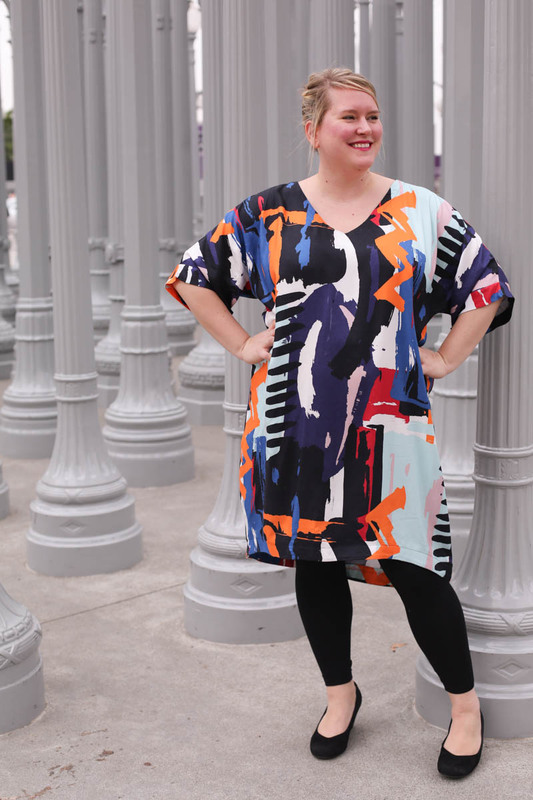 introducing the Rivermont Dress and Top sewing pattern! 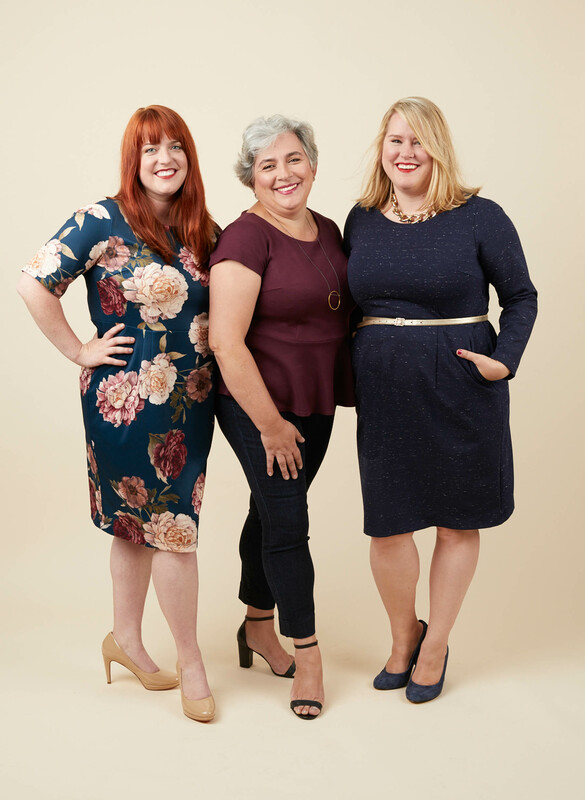 If you’ve ever hankered after a smart but totally comfortable ponte sheath dress, or a sassy peplum top that’s designed for curves, then friends, you are in luck. 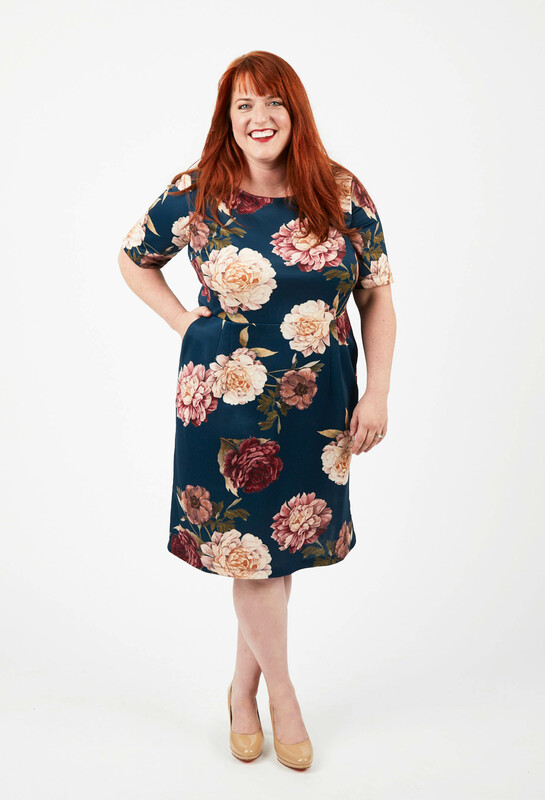 Our latest pattern, the Rivermont Dress and Top sewing pattern is just the ticket for the office, an evening out, or a really-put together weekend brunch. 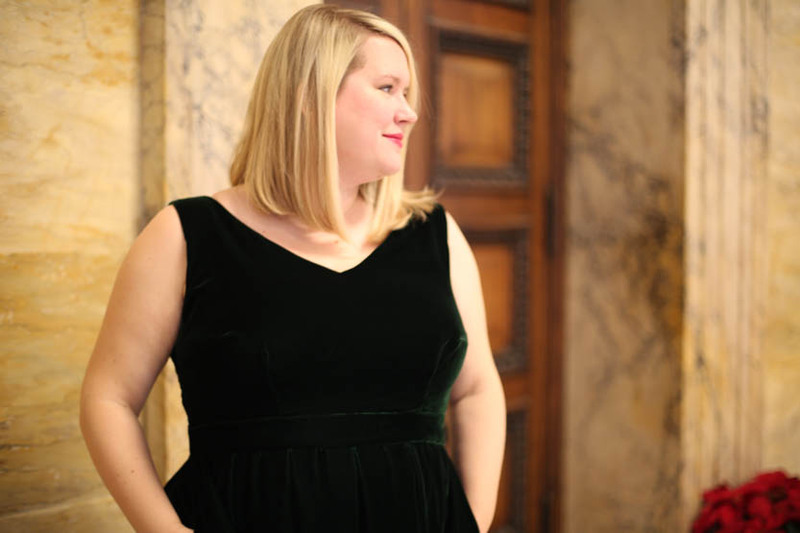 It may look formal, but don’t be fooled – the comfort of a thick knit dress knows no bounds, and you’ll find yourself wearing it all the time – I certainly do. 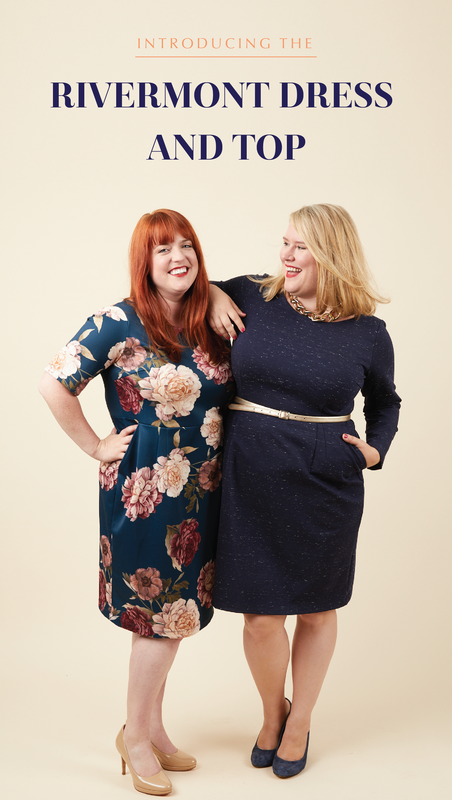 Like all Cashmerette Patterns, it’s been designed for curves, which means sizes 12 – 28, and cup sizes up to H – bye bye, FBA! 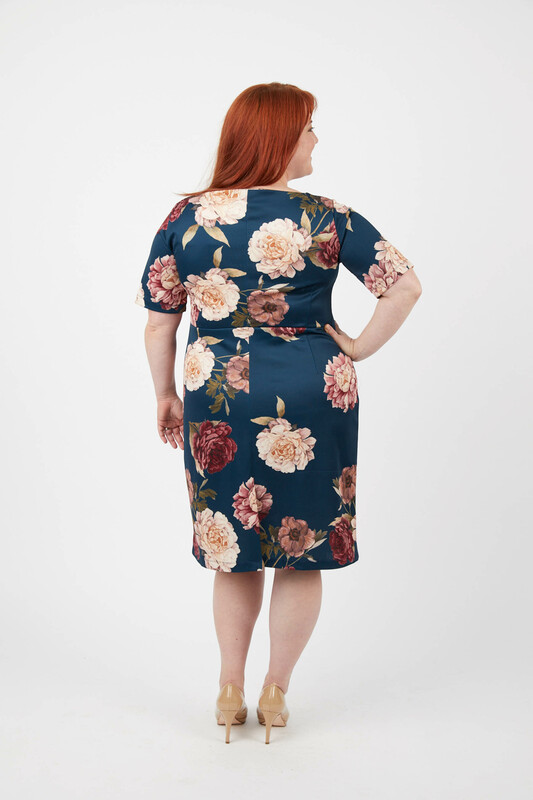 The Rivermont Dress (version A), features an elegant high faced neckline, a six darted bodice, sophisticated double darts in the skirt, and super roomy slash pockets. Turn around, and there’s a tailored back (with a built-in sway back adjustment) and an optional kick pleat if you want to turn it up a notch. There are also three sleeve lengths to choose from – I’m particularly partial to the mid-length sleeves which end at the elbow. View B is the Rivermont Top, which is the same bodice as the Rivermont Dress, and then a chic peplum added on the bottom. Depending on the fabric you use and how you style it, the top can have totally different looks. You can also use any of the three sleeve lengths here. Fancy a full skirt? A super easy hack is to extend the peplum out, and you’ll be swirling in no time. We’ll be having a full sewalong including fabric guidance for the Rivermont, but the key thing to bear in mind is that it’s designed for heavy knits, with at least 40% stretch. The best fabrics are ponte, double knit, scuba (fashion scuba, not wetsuit fabric!) or neoprene. 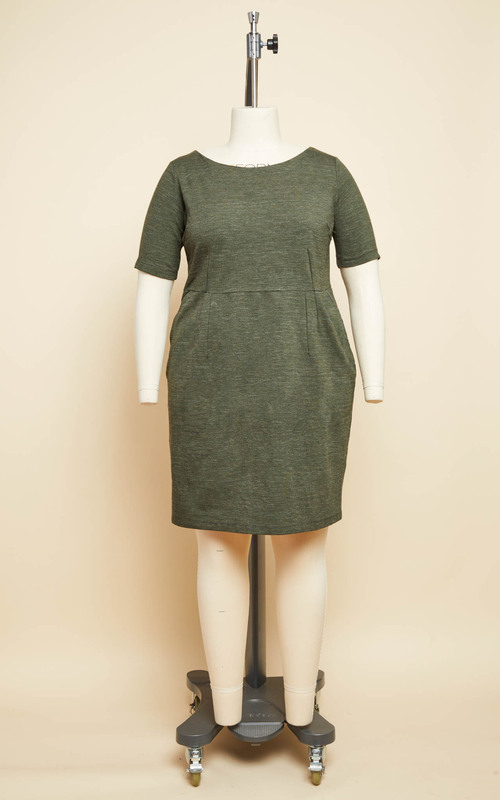 If your fabric is particularly thick, you can use a lighter knit for the neckline and pocket facings. As always, our patterns are available as a printed pattern sent to your home, or as an instant gratification PDF (with print at home, A0 and US Copyshop files). As our website has just changed, instead of having separate listings, just go to the Rivermont page, and choose your preferred format from the dropdown menu. 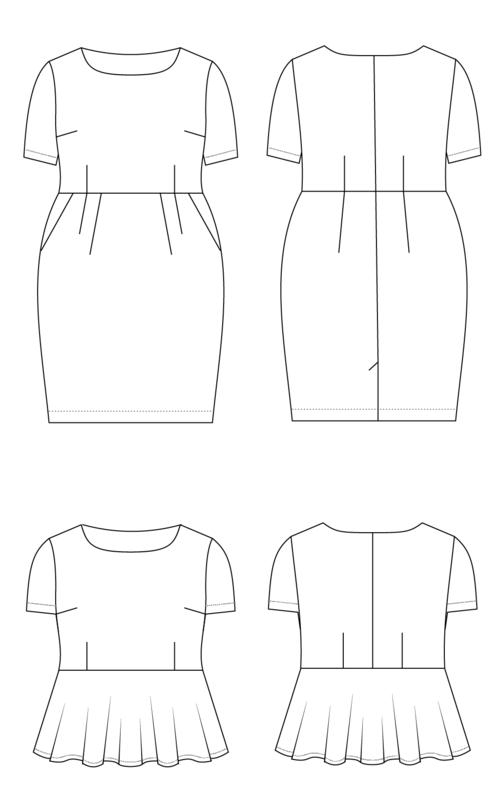 The Rivermont Dress & Top is rated “advanced beginner” because of features like the neckline facing and kick pleat, but with our comprehensive instructions, even a brave beginner should be fine! 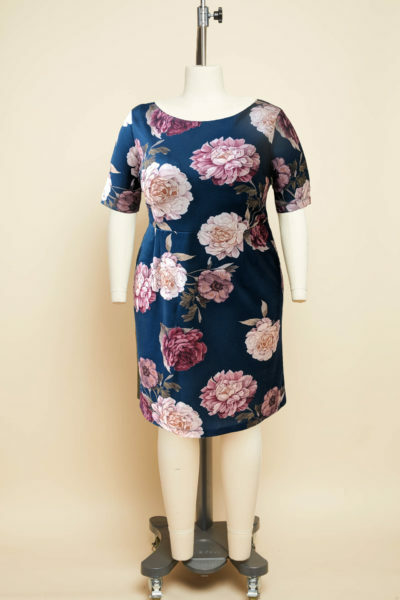 In fact, the Rivermont is a great introduction to sewing with knits because ponte is really stable and easy to sew on a sewing machine. Why not give it a go? First up, the gorgeous green that our flaming haired model Molly is wearing above – it’s actually two sided, with one side (shown here) in a lighter heathered olive pattern, and the reverse has a darker solid olive tone. You can use either as the right side! Then, here’s a rich burgundy Rivermont kit which is perfect for those of us heading into fall and winter. It goes amazingly with gold accents or rich brown boots. 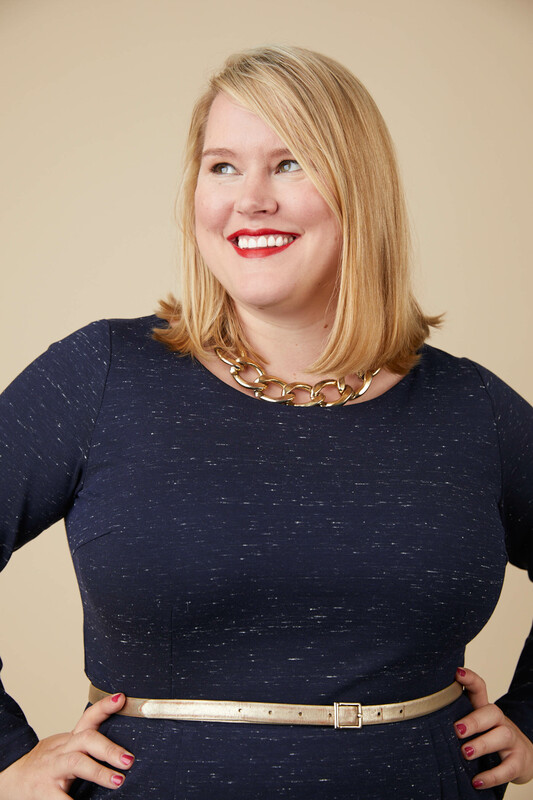 Then, this wonderful navy slub rayon ponte (which I’m wearing above), which is also double sided – the reverse is black. I’m already dreaming of a navy slub Rivermont with black sleeves! – SORRY, SOLD OUT IN NEWSLETTER PRE-SALE! And finally, this unique textured knit, which has wonderful dimension and looks like it just walked out of a designer store. The white chevrons are slightly puffy and quilted, and result in a really stunning dress. 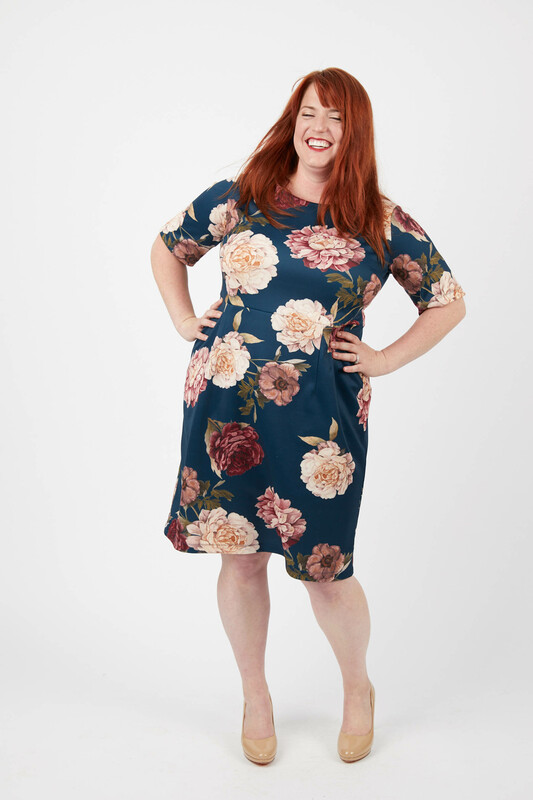 So that’s our latest dress & top sewing pattern – I hope it sparks sewing inspiration, and I’m looking forward to seeing Rivermonts in the wild. Don’t forget to hashtag your makes with #RivermontDress or #RivermontTop, and if you’d like to be considered for a feature spot on our new homepage, tag it with #CashmeretteMakes, too! 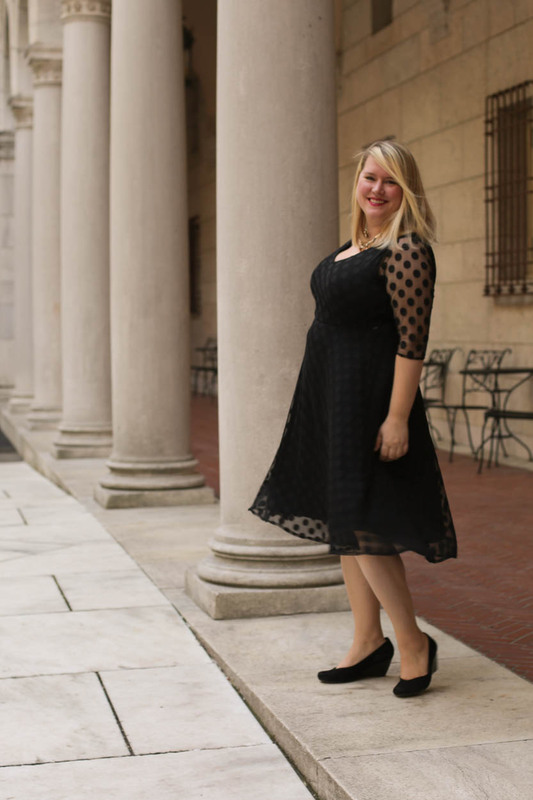 Polka dot overlay Turner Dress: fancy AND comfortable! Introducing new Rivermont Dress Kits! Are you planning a sew along for the new pattern? I just received my paper pattern, thank you! I’m attending a special work related party in just a couple of weeks and I will wear Rivermont there. I’m thinking of burgundy red ponte, but I may need to buy new brown boots!